UN Volunteers complement and strengthen the workforce of UN entities, public institutions and civil society organizations. They are qualified, highly motivated and inspirational individuals committed to the principles and ideals of the United Nations. UNV offers different volunteer categories, depending on your needs and the nature of your organization. 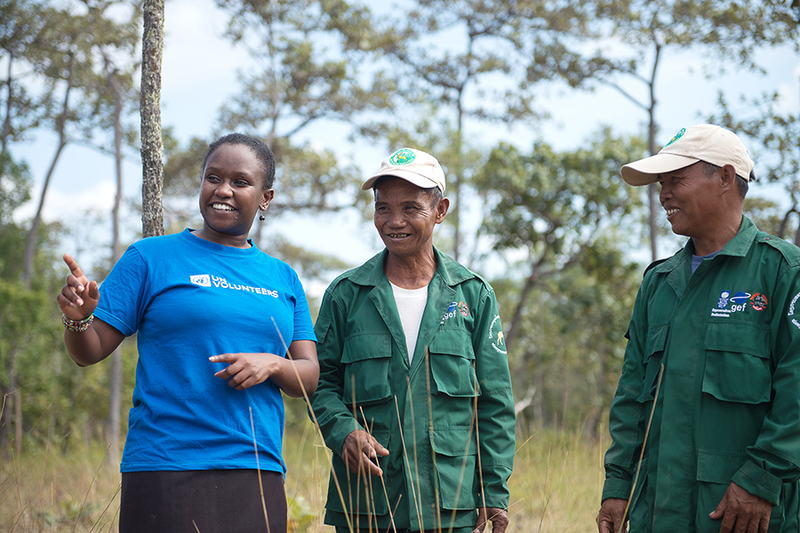 UN Volunteer, Monitoring and Evaluation Officer, Norah Ngeny (Kenya) talks to local volunteer rangers of Ong Mang Sanctuary, Savannakhet, Lao PDR. United Nations entities can tap into the full range of categories of UN Volunteers, each with its own characteristics. Do you need more information on our different categories, including related conditions of service and steps to be taken to host UN Volunteers in your office or through online collaboration? Check out additional information by clicking on the below link. Would you like to proceed? You can start your journey with UN Volunteers by creating an electronic expression of interest for any type of UN Volunteer by clicking on the button below. Getting advice on the right solution for your need is easy. Just fill out the form and we will get in touch! National governments can engage with UNV in developing programmes, policies and legislation that promote volunteerism and volunteer action through advisory services. Government bodies and public institutions can involve UN Online Volunteers to bring in extra capacities. Follow the links to find out more! Legally registered, non-profit organizations (civil society organizations) can benefit from additional capacity by involving UN Online Volunteers in their work. Follow the link to find out more!